I’m a member of the Audio Publisher’s Association, which is the industry trade group for audiobook publishers, narrators, engineers and others in the business. Part of the dues covers a subscription to Audiofile Magazine, which is the premiere audiobook industry publication. I picked up my copy yesterday at the Post Office and was very happy to find that a review of one of the books I narrated was in it! It was really odd and quite cool to see my name in print like that. 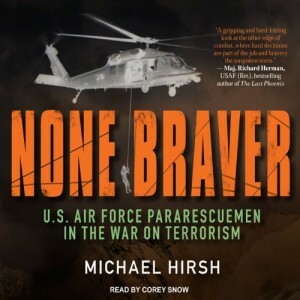 I recorded None Braver by Michael Hirsh for Tantor Audio earlier this year. It’s a deep dive into the world of the US Air Force Pararescuemen, or “PJs” as they are usually called. Their job is to be provide battlefield medical support in some of the harshest conditions imaginable. They are truly an incredible group. I was once a paratrooper myself, which is something I’ve always been proud of, but I always knew about the Rangers, the Green Berets, the SEALs, and so forth. Many people looked up to us, but we looked up to them. I didn’t even know the PJs existed until I had the opportunity to read None Braver, and I was amazed at just how tough these guys are. They have a qualification course harder than just about any other special forces training in the world, lasts longer and graduates fewer. They truly are deserving of the title “None Braver”. You can find the review on the Audiofile Magazine website here. Get a copy of None Braver from Tantor Audio, or from Audible.com! You can also hear a sample of it in my audiobook demo reel on the homepage of my site. This entry was posted on Friday, October 11th, 2013 at 4:50 pm and is filed under Audiobook, Blog, Review, Work. You can follow any responses to this entry through the RSS 2.0 feed. Both comments and pings are currently closed.